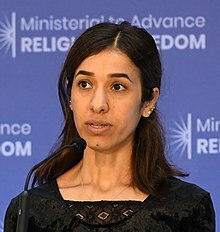 Nadia Murad Basee (Arabic: نادية مراد‎; born 1993) is a German-based Iraqi Yazidi human rights activist. She was kidnapped and held by the Islamic State for three months. In 2018, she and Denis Mukwege were jointly awarded the Nobel Peace Prize for "their efforts to end use of sexual violence as a weapon of war and armed conflict." She is the first Iraqi to win the Nobel Prize. Murad is the founder of Nadia's Initiative, an organization who work to "helping women and children victimized by genocide, mass atrocities, and human trafficking to heal and re-build their lives and communities". ↑ "Nobel Peace Prize winner Nadia Murad". 5 October 2018 – via www.bbc.com. ↑ "Nadia Murad". Forbes. Retrieved 5 October 2018. This page was last changed on 13 December 2018, at 11:51.